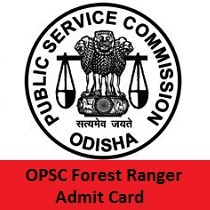 Complete details of the OPSC Forest Ranger Admit Card 2019 are available on this article. The higher authorities of Odisha Public Service Commission (OPSC) had announced the exam date for Written Test as on 14th April 2019. And they had not yet mentioned the opsc.gov.in Forest Ranger Admit Card 2019 exact release date. The Hall Ticket will be released in the month of March/ April 2019. OPSC organization members had clearly mentioned that, if the aspirants appear to the exam for the Assistant Conservator of Forests, Forest Ranger posts without the OPSC Forest Ranger Admit Card will not be allowed to write the test. At last of this page, we had given the direct link to download the OPSC Forest Ranger Hall Ticket 2019. While attending to the OPSC examination competitors must carry their OPSC Forest Ranger Hall Ticket 2019 along with them. If aspirants did not carry their Hall Ticket the organization members will not allow them to write the test. For downloading the OPSC Forest Ranger Hall Ticket 2019 you must provide the correct credentials like username and password. If not correct you may not get the Admit Card. Candidates will get the OPSC Forest Ranger Admit Card 2019 only from the official site that is www.opsc.gov.in. From this section, you can get the details that are present on the opsc.gov.in Admit Card 2019. So, if any of them are mismatched, then you must intimate to the board members. Candidates who are enthusiastic to work for Odisha government jobs can make use of this OPSC Forest Ranger Recruitment. The higher officials of the Odisha Public Service Commission (OPSC) had released the notification to fill the 67 Assistant Conservator of Forests, Forest Ranger Posts. The selection process for this recruitment is done through the following rounds. Candidates who had cleared the below mentioned rounds can only be recruited for the 67 posts of OPSC. Candidates attending for the examination should carry some mandatory documents to the examination hall. List of those documents is given below. You can carry any one of the following provided documents. Are you waiting to download the OPSC Forest Ranger Admit Card 2019? If yes you can refer to the following section to download the Hall Ticket easily. Initially, candidates who had applied for OPSC Forest Ranger Recruitment 2019 must visit the official site of the Odisha Public Service Commission (OPSC). The official site is opsc.gov.in. Then candidates will get the home page of the OPSC on their screen. Then in that section, search for the OPSC Forest Ranger Admit Card 2019 link. After getting the link open it. Recheck all the provided details correct or not. You will get the Odisha PSC Call Letter 2019 on the new page. Download that Hall Ticket as in prescribed format. Take two to three copies of the opsc.gov.in Admit Card 2019 and carry them with you while appearing to the examination. Hope that all the competitors had understood the information provided about Odisha PSC Call Letter 2019 from this article. For knowing the exact release date of the OPSC Forest Ranger Hall Ticket 2019, stay tuned to our webportal freshersnow.com. If any queries about this article comment us in the below provided box.